BATON ROUGE, La. — Cities and parishes across Louisiana hosted community prayer rallies on Tuesday to ask God to protect local law enforcement in the wake of a number of fatal police shootings. The events were the result of Gov. 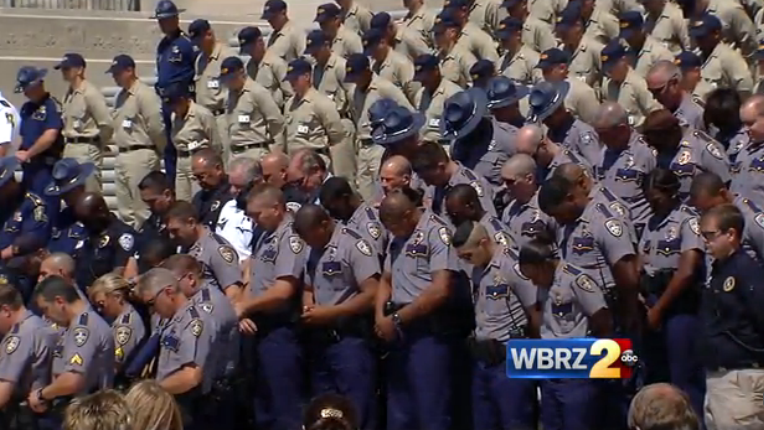 Bobby Jindal’s proclamation of Sept. 14 being a statewide day of prayer for Louisiana police. According to reports, 83 officers have been killed in the line of duty just this year, with 10 being in Louisiana. “I invite all Louisianians who choose to join in prayer to ask for&–;protection over our law enforcement men and women, to thank God for his many blessings and to seek a spiritual revival among the people of Louisiana,” Jindal, a Roman Catholic, wrote. “I encourage all Louisianians, local officials, businesses, and religious leaders within the state to organize events celebrating the life of those who have sacrificed themselves while serving our communities, and to pray protection over those who ensure the continued safety of our citizens,” he said. In Bossier Parish, several hundred people attended a “We’ve Got Your Back” rally, organized by Sheriff Julian Whittington. In New Orleans, Antoine Barriere of the Household of Faith Family Worship Church hosted a prayer service in front of the city police department. Mayor Mitch Landrieu, police superintendent Michael Harrison and other law enforcement officers were among those in attendance. A prayer rally was also held on the steps of the Louisiana capitol building, which was attended by the governor, scores of law enforcement officers and pastors. Jacqueline LaValley stood near the governor clutching a photo of her son, the late Shreveport police officer Thomas LaValley, who was killed last month while responding to a call about a disturbance in the city. “Today, we even pray for those who are against us, that they may come to realize the sacrifice of law enforcement and join us in creating safe communities,” he said.